Rainbow Watersports has a new look! We are SO EXCITED about Rainbow Watersports’ new look — most especially, our new logo! To us, it encompasses what Rainbow is all about — having an all-out good time while surrounded by beauty. Now that our logo is complete, our van has had a makeover as well. Thanks to Grace, one of our instructors, for giving the van a touch-up with a kickin’ bright blue! What do you think?!? 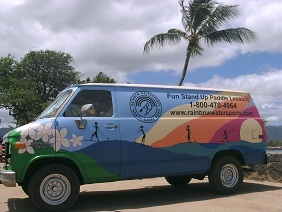 Remember to be a fan “Rainbow Watersports VAN” Facebook page!